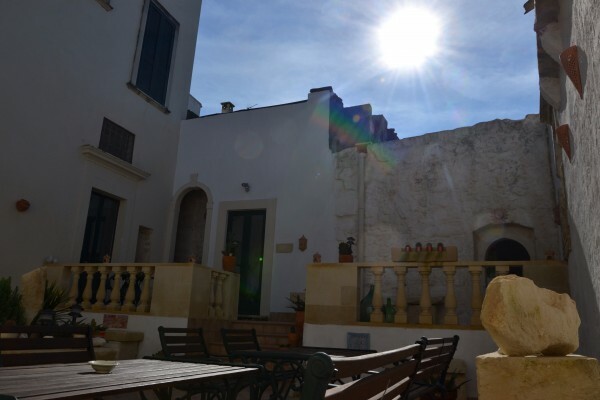 For our guests, Palazzo Muro Leccese is "the heart of Salento ," not so much for its geographical position - halfway between the Adriatic and the Ionian sea, between the beautiful Baroque of Lecce and the magic of S. Maria di Leuca -, as for the emotions that this ancient Palace of the seventeenth century arouses in visitors and guests. The honey-colored local stone, the solid white light that creeps powerfully into the "courtyard" and wraps up The Palace until sunset, the open spaces that encourage conviviality and relaxation, the scents that spread from the kitchen and take the memory back in time, to other moments, other emotions. Everything invites you to a magical escapism in a " timeless dimension", with a so wrap-around and nice service, although wonderfully discreet, that it is not difficult to understand why guests come from so far away and do not want to leave this Relais de charme and well-being. In the rooms, all differently decorated with refinement and elegance, the arches are joined in beautiful vaulted ceilings, solid, protective and unattainable, like everything that is majestic, that is history. That is there to preserve an innate beauty, a precious treasure. Fabrics and antique, precious furniture from England coexist with traditional flooring, furniture and laces from Salento and with luxurious, modern facilities, creating a regal and charming mood, eclectic like this land is. But even the food is regal and cherished, prepared with love and passion and served in a lovely dining room with wonderful vaulted ceilings and romantic niches for moments of great intimacy. Located a few meters far from Piazza del Popolo - surely the most beautiful square of Salento for that typical stone, so warm and compliant with artists' mastery - the building dates back to the seventeenth century and was refurbished for the first time in the '20s, acquiring numerous delightful architectural details in Art deco style, and then recently, under the supervision of the Cultural Wealth Ministry to preserve its authenticity and style. Like all the ancient houses, The Palace is built around its “corte” (courtyard). Today all rooms overlook on this space, but in the past it housed the stables, the well and the “pila” (stone laundry) with its grooves (li stricaturi ), confirming the remote intent to make it a common living space, a kind of popular lounge where families spent their days working and helping each other and in the evening they huddled round to listen to the stories of the wise old men which captured the imagination and the attention of the younger ones. Beyond the courtyard, a delightful garden and a wellness area, an oasis of peace originated from love for well-being and relaxation, where you can rediscover the joy of well-spent time. Naturally, with such elegant surroundings to enjoy you may not wish to leave this residence of charm, preferring instead to relax in the reading room, find a quiet corner in the garden where try your hands at crochet, sipping tea in the Aubergine room or enjoying - in the shade of the orange and tangerine trees - the flavors of authentic cooking, refined, driven by love for the good things. SublIme. The Palace is our paradise here and every day is a gift to be enjoyed . We asked our guests what they loved most . Some have said the luxury of the rooms and food , other services designed to prevent every desire . Still others how they have been pampered as special guests. Organisation of routes and tours to discover the Salento gastronomic traditions , art and culture . Elegant and luxurious en suite bathroom with large shower, hairdryer , welcome kit for the bathroom, wardrobe , mini fridge, flat screen TV , satellite channels, DVD player , safe, air conditioning, heating, vaulted ceiling , marble floor or tile vintage , fly , hypoallergenic bedding , blankets and duvets available, fluffy pillows , armchairs, furniture and furnishings and fittings in the tissues of Wiltshire ( England) or finely reported according to the tradition of Salento, overlooking the courtyard or large private terrace . No experiences yet with Palazzo Muro Leccese - Relais de Charme - B&B. Be the first! 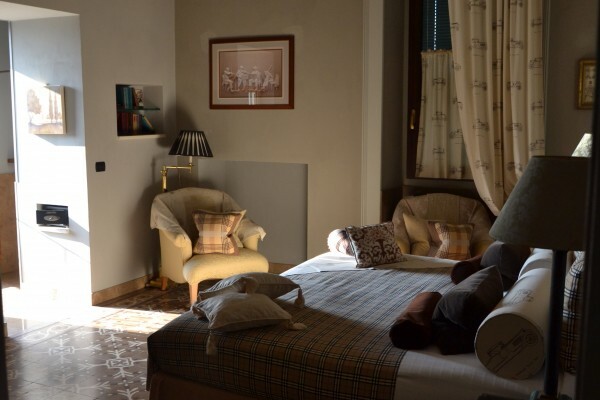 Did you stay in Palazzo Muro Leccese - Relais de Charme - B&B? Let us know what you thought about it and help others to make the right choice! * I confirm having stayed in Palazzo Muro Leccese - Relais de Charme - B&B. 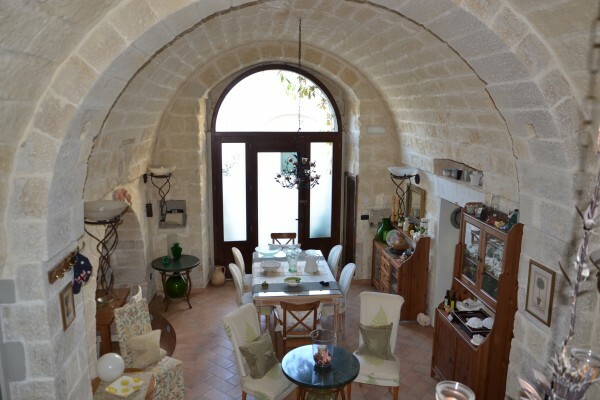 Find other bed & breakfasts in Lecce or all bed & breakfasts in Apulia.